While attending a RV Rally recently, a few attendees commented on the failure of their towing systems. Before going into details, I’d like to thank Bob Young of the Mid America Bounders Chapter of Bounders of America for providing much of the information and photos of the defect. Towing system failures usually mean the towbar or baseplate separates from the RV. However, in this case, the actual Hitch Receiver broke away from its mounting area because the welds (highlighted by the Yellow Arrows in the two photos) that connect the receiver box to the hitch receiver frame assembly were defective. The Hitch Receiver assembly is attached to the RV’s frame before the RV body is installed on the chassis. The Hitch Receiver is designed to tow 5,000 to 10,000 pounds (2,258 to 4,536 kilograms). On larger RV’s, the hitch receiver may be rated to carry 15,000 to 20,000 pounds (6,803 to 9,071 kilograms). If the Hitch Receiver Box (see the Second Photo), that the towbar or drop receiver pushes into (and is held in place by a hitch pin in one of the side holes), separates from its supporting frame, the towed vehicle is "free”. Of course, your first thought is that the towed vehicle will be secure because of the safety cables. On this and many other similar Hitch Receivers, the safety cables are attached to a pair of loops welded below the receiver box (Red Arrows in the second and third photos), or to a plate with holes in it, that is welded below the box. If this assembly becomes detached from the Hitch Receiver mounting frame, the towbar and safety cables also separate. Since the Tow Vehicle Braking System’s breakaway cable is often attached to one of these loops or the hook of the safety cable mounted on the loops, the towed vehicle most likely will not be braked by the brake system’s breakaway switch. In this failure, the pin would not be pulled from the switch, since the towbar and safety cables are still attached to the hitch receiver. The third photo shows these loops clearly in addition to showing that the welds, that should have penetrated the mounting area, never did (yellow arrows). If this was an isolated incident then we would not spend a lot of time worrying about it. However, a number of Rally attendees reported this failure. While we can point a finger at poor product quality, the heart of this issue is Safety. Since there have been repeated failures, it is important for all motorhome users to check the integrity of their towing system. Of course, examining welds may be beyond the capabilities of many motorhome users, so consulting a trained professional is recommended. If you can see any visible cracks or deterioration other than surface rust, then do not tow until you have the Hitch Receiver examined. I recommend removing your towbar at least once per year and examining the Hitch Receiver for any visible cracks, either in the welds or the metal itself. It also is a good idea to clean the metal and apply some Rust Preventative paint to both the Hitch Receiver and the towbar, to lessen the corrosion that will occur. While you have the tow bar out of the Hitch Receiver, examine it carefully. Are there cracks in the metal especially around the hitch pin holes? As you can see in the two photos of the tow bar section, it cracked at the hole which was inside the Hitch Receiver. The owner realized as he was towing his Chevrolet Malibu that suddenly the car was back in his rear-view camera -- it was dragging on the safety cables! Fortunately, his recently installed braking system activated and he safely dragged the car behind his RV to the side of the road. The portion of the tow bar to left of the yellow line represents the portion inside the Hitch Receiver That part cracked and over time that crack increased in size. The second picture shows the silver colored metal which was all that was keeping his Malibu connected to the RV. When those sections cracked, his car was only attached to the RV by the safety cables. You would not know about this impending situation unless you removed the towbar from the Hitch Receiver of the RV. As these examples demonstrate, dangerous situations can develop in what appear to be safe, well-made components. Check the integrity of your tow system. Grab the car connections points and forcibly move them up and down. If there is any play in them, have the attachment bolts of the baseplate or bracket examined to ensure the bolts are present, tight and secure. Also have your tow bar examined to ensure it is properly lubricated, that metal wear is within tolerance limits and all nylon parts are not worn below safe thickness. Make sure all components are operating properly and secure. 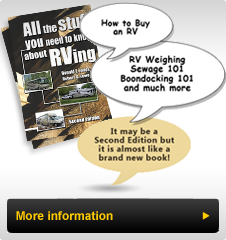 RVing Safely is a way of life!